Sells skateboard decks, trucks, wheels, bearings and accessories. Panoramic photographer specializing in aerial photos of sports stadiums and city scapes including New York City, Omaha, and Chicago. Vinyl for sale. 12', 7', 10', Rap, R&B, Rock, Pop, Dance, many Promos. Autographs, jerseys, cards and collectibles. Specializing in Kansas City Chiefs and Royals memorabilia. New York City books, videos, maps, prints and posters, gifts and collectables. The essence of New York City in a store. Provides new and used parts, full workshop, paint, panel and trim facilities to concours restoration for all MG sports cars. Online distributor of jerseys, clothing, glassware, and other memorabilia for teams in the NHL, IHL, AHL, as well as international teams. Offering food, books, guides, souvenirs and memorabilia with a city theme. Mackinaw City, Michigan shop specializing in sea shells, coral, and nautical items. Offers antique maps, globes, atlases, city plans and views, and nautical charts. Located in New York City. Offers cards from all sports, not just basketball. Detailed city maps of late 19th and early 20th century city and town plans. Also a limited selection of regional map reproductions from central and eastern Europe. Chicago-based sports magazine that sells sports novelties and kids toys and games. Limited Edition sports art and sports art collectibles autographed by professional athletes. Manufacturer of apparel, sportswear, and protective wear for watersports, snowsports, xtreme sports and contact sports. UK. Womens sports and athletic apparel. Sports bras, running shoes, and workout tops and pants. Webster City, Iowa. Hickory smoked hams and bacon. Specialize in sports cards, collectibles, memorabilia, autographs, posters, plaques, helmets, and sports gift items. Basketball goals and accessories offered from manufacturers such as Huffy Sports, Lifetime, Schutt Sports, First Team, and Silverback. City of Chicagos official store, featuring retail and online sales of city surplus and salvage, memorabilia, souvenirs and gift items. Selection of over 2,000 different sports posters. Worldwide shipping, all sports and eras. Offers current and retired villages, accessories, and figurines. Includes collectors forum, search feature, and directions. Located in Oklahoma City, Oklahoma. Funny T-shirts featuring the 'Harm City' logo. Provides sports medicine, sports care, and prevention products. Offers hand-held sports scorekeepers for various sports. Licensed team sports collectibles and apparel for NFL, NHL, MLB, NASCAR, and collegiate teams, including sports caps, mugs, buckles, die cast trucks and wallets. Port Royal: Pirates of Paradise. The once infamous Jamaican pirate city comes alive in this new novel based on the legendary pirates of this partially sunken city, the home of Sir Henry Morgan. A large, indoor, antique and collectibles fair, which is held in Atlantic City, New Jersey several times a year. Sports collectibles website designed for the collector of autographs, cards, comics and other sports related memorabilia. Software for sports and recreation events, including challenge ladders, tournaments, round robins, and sports parties. Developed for tennis, but applicable to many other sports. If the business hours of Rat City Skates in may vary on holidays like Valentine’s Day, Washington’s Birthday, St. Patrick’s Day, Easter, Easter eve and Mother’s day. We display standard opening hours and price ranges in our profile site. We recommend to check out ratcitysports.com for further information. 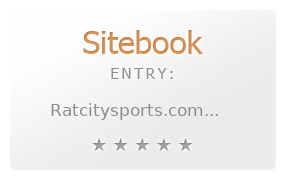 You can also search for Alternatives for ratcitysports.com on our Review Site Sitebook.org All trademarks are the property of their respective owners. If we should delete this entry, please send us a short E-Mail.